Mary thinks her life is settled. Her acting career isn’t exactly skyrocketing, but Mary seems to get parts as far afield as Lady Macbeth and the Ghost of Christmas Present without auditioning, so she much have some reputation as a Thesp. Her family has the usual peculiarities — a mother who never says a discouraging word, a gossipy, meddling aunt who wants to arrange everything — but she is close to them, and when we meet, she is visiting them in Ohio for her favorite holiday, Thanksgiving. Mary is engaged. Her beau was detained in New York by business and didn’t accompany her to Ohio as scheduled, but Mary is sure wedding plans will go out as expected. Until sitting relaxed in her parent’s armchair, she watches the Macy’s Thanksgiving Parade from New York and spies her intended kissing another woman. With passion. The shot is blurry and only lasts for the requisite five seconds, but Mary is sure she knows what’s she seen, and the evidence is enough for her break off her engagement and return to singledom, uncertainty in her personal life now matching the ups and downs of her career. Between the men Mary meets and her attitude towards some of them, you wonder if she’ll ever see another bauble on her ring finger. Hoben has characterized Mary as a critical New Yorker who wants perfection. Through the lines, you can see the rules Hoben applies to dating and relationships. Some make sense. Some are stultifying in their stringency and early 21st century correctness, but Hoben gives Mary standards, logical or not, and these are her tools as she sees if there is anyone on Earth she is willing to marry. “The Twelve Dates of Christmas” is typical of the frothy, perky solo pieces that are current today. Its heroine is pert, smart, and likeable. Even when Hoben has her do something that doesn’t make sense, like blithely throw her engagement ring in a Salvation Army kettle — hear her roar — or skip out on a New Year’s Eve date with the guy who turns out to be the best of her prospects, you are willing to go with Mary, to side with her and be her friend and confidant. Hoben’s material is bright and funny enough. The author is capable of framing a good joke, and most of her observations will find general agreement from men and women in the Act II audience, but the scripts stays pretty much middle-of-the-road. It neither bursts with wit and insightful perceptions about life nor turns Mary into a chronic complainer and malcontent who bores and makes you happy to see her final bow. As an entertainment, “The Twelve Dates of Christmas” satisfies, and Maggie Lakis, who plays Mary at Act II, makes you hope she’ll find someone of substance and consequence soon. To Hoben’s credit, she doesn’t saddle Mary with a parade of losers and jerks. Most of the men Mary meets are eligible and have something to initially recommend them. Of course, some of them also have wives, girlfriends, and other commitments, but what would a play about dating be like without those conflicts? Dating is the subject of the play. Mary’s hunt for a partner is the focal situation. The holidays figure in because Mary in fond of them, and the Thanksgiving-Christmas season of one year and the winter holiday season of the next serve as good bookends with which to encompass the time frame of Mary’s adventures. Family is also a leitmotif. Not knowing what happened during the Macy’s Parade, Mary’s younger sister gets engaged the Thanksgiving she gets dumped. That sets up one conflict. Aunt Kathy is disappointed she can’t control Mary’s life. That’s another. And at some point, Mary stops speaking to anyone with whom she’s remotely related. That’s Hoben being high-minded and unrealistic. So, you have a woman on a quest. Two quests. She doesn’t have to find a man but would like to. She needs to work to keep up her New York apartment. The work situation is settled early, so the concentration could be on dating. Lakis is called on to play all of the characters, so she needs an array of voices to represent the men she meets and the women in her family. In general, she does well with the distinctions between characters. Only once did I question a vocal choice. That occurs when Mary bumps into her ex, you know the Macy’s Parade smoocher, and agrees to go to coffee with him. The guy sounds like a lug. He has that slow, deep New York accent that makes you think he’s a lounge lizard or a race track tout. Hearing that voice, and that diction, you can’t imagine Mary dating this guy in the first place, let alone agreeing to marry him. Lakis is a wonderful narrator. She holds her energy and rapport with the audience throughout the play, even during an awkward moment when she brings two unsuspecting souls on stage to parry with her. The two guys I saw did well considering they don’t have the benefit of a script or rehearsal, and the sequence with them shows Lakis can think on her feet and, like Mary, know when to rid herself of a crumb. The play ambles along with spirit. Mary has a typical New York life. She can recite Starbuck’s menu (even though she works for a rival), and she takes time to enjoy the city, which gives her occasion to meet men on subway platforms, at bars, and in the café where she works. Mary eventually meets the man of her dreams, the one she connects with most after a year, but here Hoben plays a trick. The beloved creature is not suitable for Mary. If “The Twelves Dates of Christmas” was not so breezy, and Mary’s declaration of love mostly ironic, the revelation sequence could make people wonder about Mary’s sanity. 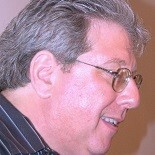 Tony Braithwaite keeps the show moving as Lakis’s director. Each date on Mary goes is symbolized by an ornament for the stage’s downstage right Christmas tree. Some of the ornaments are clever. One is a little arch, meant to be witty and contemporary but missing the mark. “The Twelves Dates of Christmas” proceeds quickly and entertainingly. It won’t make you think much, but it has enough good lines to make you laugh. And Scrooge, Tiny Tim, and Santa are only mentioned in context. I don’t remember a reindeer or nutcracker being mentioned at all. “The Twelve Dates of Christmas” runs through Sunday, December 29 at Act II Playhouse, 56 East Bulter Pike, in Ambler, Pa. Showtimes are 8 p.m. Thursday through Saturday and 2 p.m. Saturday, Dec. 28 and Sundays. Tickets range from $34 to $29 and can be ordered by calling 215-654-0200 or going online to www.act2.org. 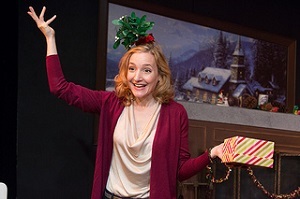 This entry was posted on December 21, 2013 by nzoren in Theater Reviews and tagged Act II Playhouse, Ambler, Christmas, Comedy, Dating, Ginna Hoben, Maggie Lakis, Solo, The Twelve Dates of Christmas, Tony Braithwaite.